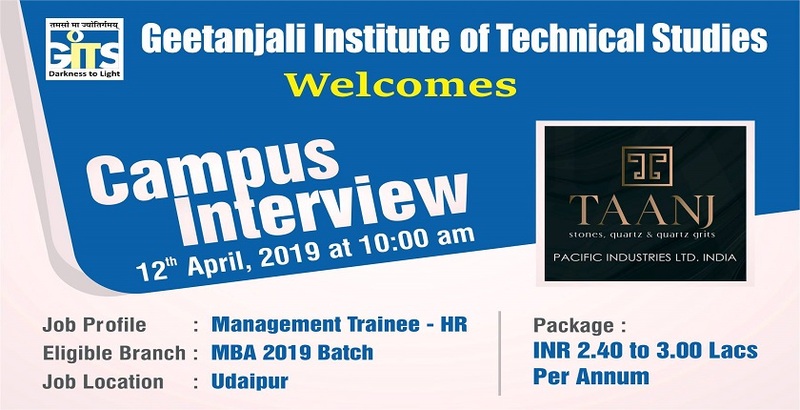 GITS is organizing the Campus Interview of our New and fully automated “Quartz Slab Plant” with State of the art technology in Udaipur City TAANJ “Natural Stones and Quartz from the house of Pacific Industries Ltd. (Geetanjali Group of Companies – Udaipur) for the Profile of Management Trainee – HR @ Package of INR 2.40 to 3.00 LPA on 12th April, 2019 at 10:00 am for the shortlisted students from MBA (HR) 2019 Batch. Pacific Industries Ltd was established in the year 1989 as a 100% export oriented unit by our eminent industrialist Shri J.P. Agarwal and today we are one of the leading quarry owners and processors of natural stones. With products like slabs, tiles, cut to size, we are enjoying our presence in over 40 countries. After Confirmation as per performance Package will be in between INR 2.40 to 3.00 LPA.